I'm a bit curious about this flapping bird. I downloaded it yesterday and have it uninstall today. I was trying to push and push this bird to its limit, but it likes diving as quickly as possible as it can. I've hit my best at 10 after 6 hours of intermittent playing. 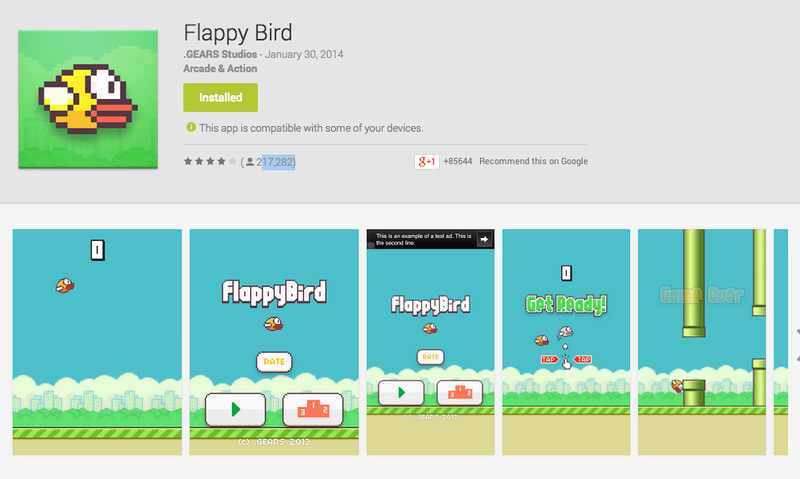 Flabby bird was released in 2013 but gain its popularity in the last couple of weeks. I don't know what marketing strategy the developer did, but it did hit the android players. Maybe because of social media giant Facebook. It was addicting at first because you want to tease others of your high score. Doing so leads you to bump the bird on the first pipe. The secret of the game leads in your hand. You have to be consistent and in sync like a metronome beat. You have to take caution on where you land at and where you're flying. This bird is really stupid. It can't fly a straight line. If you are to track its flight, I believe it would look like a stock market index. Some say it's a Satan's difficult level. Uhmmm? Really. Its just a start of the game and the severity of the level are too high. Actually, according to my source its a bug in the program. It is a rule that in order for you to achieve consumers you have to let them addicted to the game. You have to put them in a situation that they are achieving level by level. That they are making progress. This Flip bird's developer didn't do that, but instead he let the bug in his head comes out of this piece of software. Unfortunately, when the time he was really decided that he would rather put the level 1 to easy mode. He got struck by a green pipe coming from nowhere. Flappy bird was a legacy. A piece of software that can be addicted to play but harsh. In case you wanted to start ruining your life its avaible for download. FREE! at your favorite Google Playstore. Warning: Don't let your kids play this game. Please see below link regarding a teen who kill his brother because of this game.